HANDHELD MILK FOAM FROTHER - Automatic and portable electric hand held milk frother mini machine is the perfect replacement accessory for manual whisks to turn hot or iced morning coffee into an Italian barista style cappuccino or espresso latte. 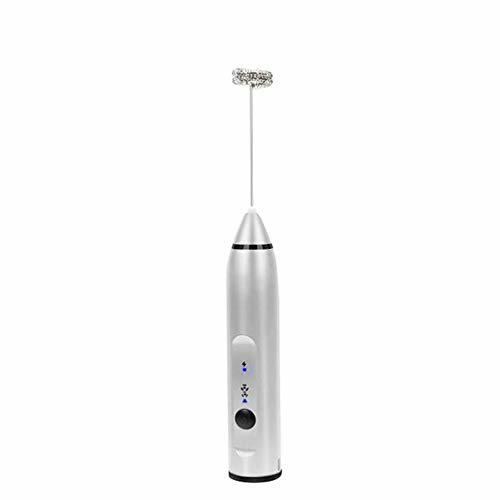 POWERFUL METAL MIXER WAND - Frother whisk stick with spring tip disc base is made of durable stainless steel with 3600 rpm motor that produces very little noise, and delivers double the power of other professional battery powered frothers or steamers. FAST LIQUID DRINK FOAMER - Foam maker delivers delightfully creamy dairy texture in 15-20 seconds for whipping up chai tea or matcha latte. Try with warm soy, almond or coconut milk; as an egg white beater; or to blend cold smoothies or cocktails. POWERFUL: DC power, rotary speed 10000rpm, small but powerful. QUALITY AND SERVICE GUARANTEE: 100% new high quality.The quality of our products is absolutely trustworthy. You can buy with confidence.After purchase if you have any questions please contact us at the first time. We will solve it for you immediately. We always believe that good service will be the way to retain customers so we try our best to do our best. If you have any questions about this product by kbxstart, contact us by completing and submitting the form below. If you are looking for a specif part number, please include it with your message.